Brief Overview: Cymatix is an introduction to sound healing principals through the Science of Sound & Vibration. 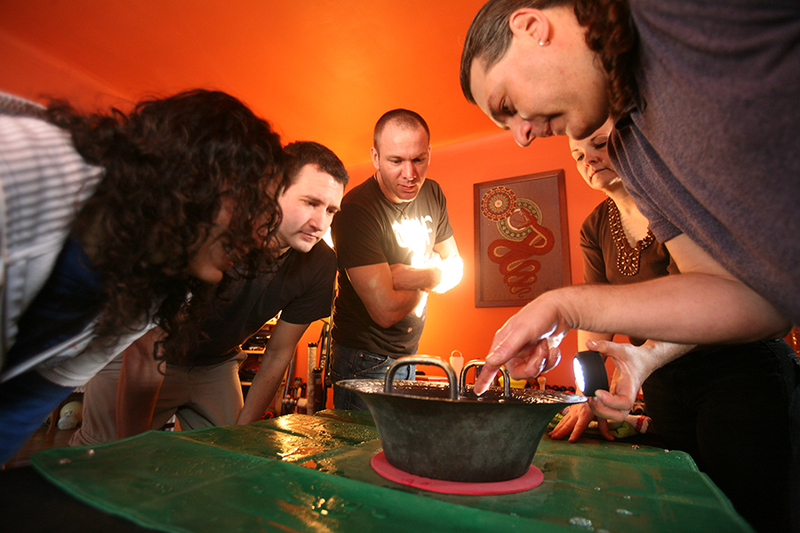 Participants learn through hands on experience, the science and techniques of using Sound for Spiritual growth and personal well-being. Cymatix: The Science of sound and vibration. Participants will explore the foundations of sound and its amazing potential for use in Spiritual growth and personal well-being. Through hands-on demonstrations using scientific equipment you can make at home, watch sound frequencies organize solids and liquids into astounding geometric patterns. Freely explore over 100 musical instruments from around the world. Discover how to play and work with these incredible tools to both give and receive restorative sound sessions in a Sound Spa. With your new understanding of sound, be refreshed and revitalized to the core of your being! Experience the relaxing power of deep sound massage and be bathed in gentle waves of an organic ocean soundscape which you will both give and receive in this group setting. Rest, relax and enjoy your dream journey inspired by live, mystical soundscapes. All materials are provided, and simple instruction on how to use this rare collection of instruments is given. You do not have to be a musician to create beautiful soundscapes; simply allow the group’s natural unfolding to guide you in what is appropriate for the moment. Every soundscape created is unique, influenced both by the people playing the instruments and those receiving the rejuvenating sound. In four and half hours this workshop will show you the the science of sound and how it applies to personal growth. No experience is necessary, and all equipment is provided. Suitable for ages 16 and older. Bring an open mind and an eagerness to explore and discover! Throughout the Cymatix workshop, a large and rare collection of instruments are provided for participants to explore, which may include: Tibetan Singing Bowls, Bells and Tingsha, Crystal Singing Bowls, Gong, Cymbal, Kalimbas, Harp, Guzheng, Pythagorean Monochord, Didgeridoos, Txalaparta, Oscar Steel Tongue Drums, Djembes, Ashikos, Talking Drums, Medicine Drums, Bodhran, Doumbek, Udu, Ocean Drum, Thunder Drum, Specialty Rattles & Shakers, Animal Calls, Unique Whistles and more. Anasazi Flute, Shakuhachi Flute, Native Love Flute and other wind instruments will also be demonstrated.